Oven Cleaning Residential & Commercial Kitchen Romford RM | Quality Property Care Ltd.
You care about the healthiness and quality of the food you and your family eat? Keep your cooker or oven is clean. The nasty burnt on carbon residue and grease and grime on your oven can be bad for your food. 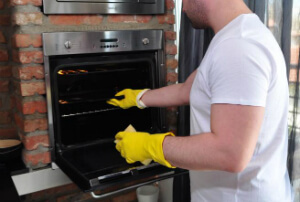 To make sure your oven is perfectly clean and safe, call Quality Property Care Ltd.. We provide expert and efficient oven cleaning in Romford RM. Our residential and commercial oven cleaning service is preferred and recommended by a growing number of homeowners and owners of professional kitchens. The professional oven cleaning company offers deep cleaning of all kinds of ovens, cookers, hobs, cooktops, microwaves, fridges, freezers, extractors, grills and other kitchen appliances at a very tempting oven cleaning prices. Call the professional cooker cleaning company to receive your free estimate in 2 hours. You can also send an online request form. Customer support is available, so go ahead! Don’t hesitate and ensure that your food is tastes better and your oven will live and work longer and efficiently. Book the deep oven cleaning services of Quality Property Care Ltd. today! Once everything has been cleaned we put all parts together and let them dry. The surface of the stove is polished with a special finish for the glass of the oven door to reduce mild scratching. You inspect the completed job and determine if it’s up to your standard. If you are not satisfied with it, the cleaners will attend to the areas which cause the problem and clean them again for free. We also provide full kitchen cleaning including light switches, all surfaces, inside and outside of appliances with deep cleaning of freezers, fridges, cupboards and even the floors and sinks. Our professional oven cleaners have the ability to properly clean a wide range of stoves, ovens, hobs, ceramic hobs, hotplates, ceramic cooktops, BBQ racks, gas hobs and grills, Rayburn range cookers, microwaves, AGA cookers, Extractors, Stanley range cookers, cookware, warm drawers, fridges and freezers and all of your kitchen appliances at once upon request. Proper cleaning for electric cookers and free-standing ovens, halogen hobs, ceramic and induction hobs. Our cleaning service is for residential and commercial customers. We work with special brands of cleaning materials and detergents to maintain the appearance and function of your range ovens. We are familiar with brands like Rayburn range cookers, Rangemaster range cooker, Smeg Range Cooker, Alpha range cooker, Stanley range cooker, AGA range cooker. We can also perform tile and grout cleaning, duct and ductwork cleaning, dishwasher cleaning, structural cleaning, canopy cleaning, splash back cleaning and more. In addition to these, our reliable oven cleaning company Quality Property Care Ltd. is a master of disinfection of all these widely spread cooking device brands: Rayburn, Rangemaster, Smeg, Aga Range, Alpha Range, Stanley. We hire only well-trained and educated oven cleaners Romford RM with experience and great approach to thorough cleaning. If you believe in healthy lifestyle and nutrition, you should never forget about the clean environment. It is a factor that matters even more than the origin of the products you cook. So don't leave your oven greasy, dirty and full of bacteria. You can rely on our first-class oven cleaning assistance. Don`t give up on healthy cooking and don't put on risk people around you! Get the oven cleaning Romford RM deal now! Contact us on 020 3746 4287 and get your free quote or ask for more information. Keep cooking tasty and healthy with Quality Property Care Ltd. and book professional oven cleaning service today!